The AVE pollutes 29 percent less than traditional trains. Credit: FFE. High-speed trains consume 29% less energy than conventional trains per passenger transported, and reduce CO2 emissions by the same proportion. These are the conclusions of a study by the Spanish Railways Foundation published in the journal Transportation Research Record. "A high speed train operating in normal conditions consumes less energy and produces less CO2 emissions per passenger transported (on average 29% less) than a conventional train travelling between the same two points at a lower speed", Alberto García, author of the study and a researcher at the Spanish Railways Foundation, tells SINC. The engineer explains that the AVE consumes less due to the intrinsic features of the high speed system, "such as its more standardised speed profile and the lower number of stops and curves during the journey". The consumption of auxiliary services (air conditioning, lighting and ventilation) is also reduced in direct proportion to speed. With regard to emissions, high speed trains use an electric traction system, meaning they do not emit greenhouse gases and contribute less to fossil fuel consumption than other means of transport. In this respect they are the same as other electric trains. Alberto García stresses that the prime advantage of a high speed line is not in substituting conventional trains, but rather in attracting a large number of travellers who would otherwise travel by aeroplane and private car. The AVE prevents the 3 kg of CO2 per passenger being emitted into the atmosphere in comparison with other trains, but when looking at the bigger picture of how much pollution is saved if a traveller does not travel by car or aeroplane, this figure rises to 31 kg of CO2. In order to carry out the study, which has been published in the journal Transportation Research Record, the engineer used 2008 data and a simulator developed by the Spanish Railways Foundation, validated by the records from more than 15 years of high speed train operations. The mathematical simulator has made it possible to cross-reference almost 200 variables related to the conventional train and the AVE (track characteristics, number of stops, electrical systems, correction coefficients, etc.) on 10 medium and long distance journeys. 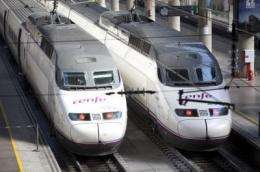 The study includes the two high speed lines inaugurated this week  Madrid-Valencia and Madrid-Albacete. More information: Garcia Alvarez, Alberto. "Energy Consumption and Emissions of High-Speed Trains". Transportation Research Record 2159: 27-35, 2010. Probing Question: Why don't we have high-speed trains in the U.S.?